Hi friends! 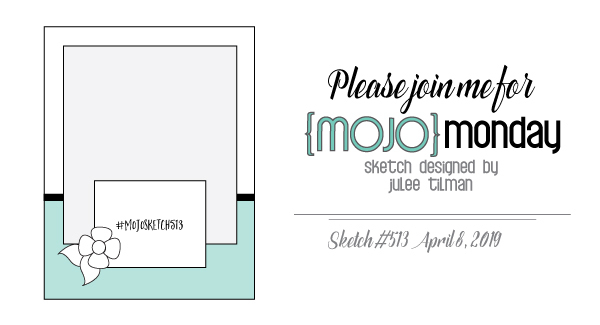 I'm back again with a card using more of the February My Monthly Hero kit and add-ons. I just love the theme this month and had such a blast creating. If you haven't checked out the February My Monthly Hero Blog Hop yet, there's still a chance to comment along the hop for a chance to win this month's kit. 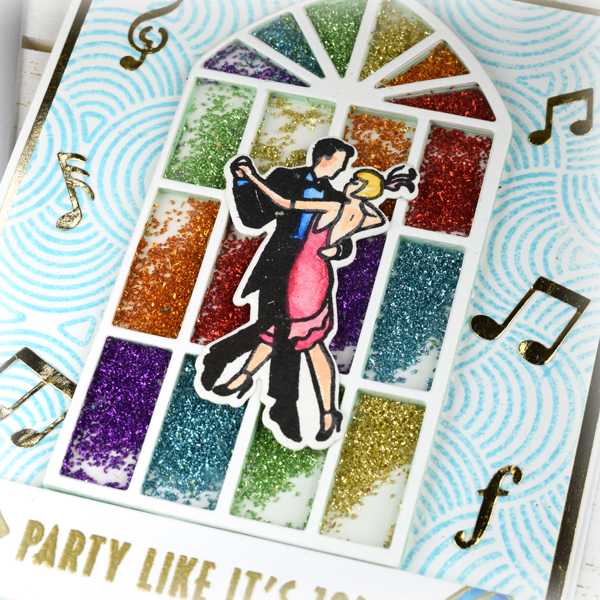 This card started from the idea of making a shaker with the Ballroom Window Fancy Die. I thought it would be so fun to fill those little panes with different colors. So I cut the die from white cardstock and also from a foam sheet and glued them together. I separated the two dies and used the outer section for the acetate for the shaker and to close off the back after I sprinkled a rainbow of German glass glitter. Now if you're doing this yourself, I'd suggest you use two layers of foam, not just one. And be super careful when you stabilize the card, because if you're finger sticks to the adhesive, the glitter will go everywhere! Ask me how I know! Haha! Once the shaker was done, I set it under some heavy paper pads to dry and moved on to the rest of the card. My eye was drawn to the beautiful Arch Pattern Bold Prints background. I love the pattern, as it can lend itself to many different uses. Once I embossed it with tumbled glass distress oxide ink and clear embossing powder, I added some more of the gold accents that I had previously die cut from the Dancing Music Notes Confetti Die. As it looks now, I think the background almost looks like spinning music records. Yes, I am from the record player era! 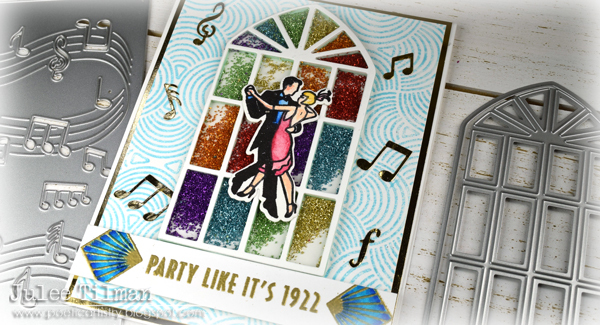 😀 The dancing couple is from the February My Monthly Hero main kit and I colored them with Neocolor II watersoluble crayons and cut with the coordinating dies from the kit. 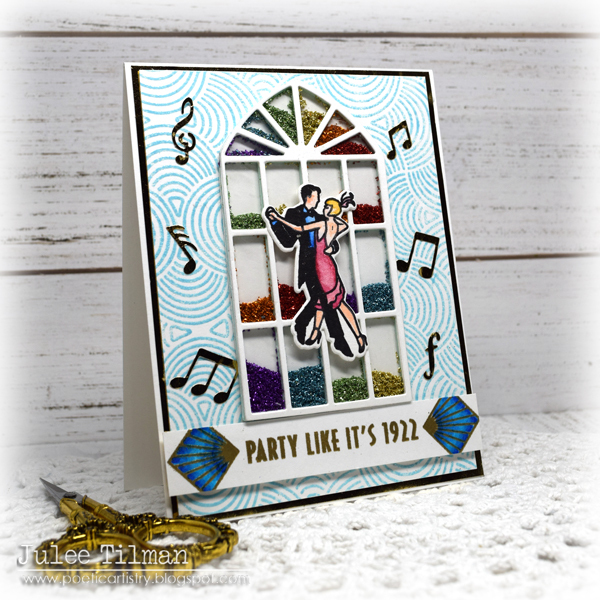 I had intended to use the kick up your heels sentiment from the kit on this card, but had previously embossed and colored this party like it's 1922 sentiment for a different card, but decided against it. I thought it looked a little better than the kick your heels up sentiment, so it was saved from the scrap pile! I finished off with a shiny gold mat and a white card base. Thanks so much for stopping by today. 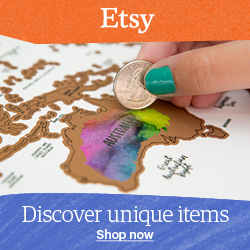 Just a reminder that if you're a kit subscriber, you have the opportunity to shop and add items this month without any additional shipping charges. 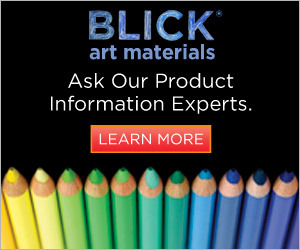 Simply log in to your account at Hero Arts and place your order by Thursday, February 7th at 11:59am Pacific in order to take advantage of this offer. 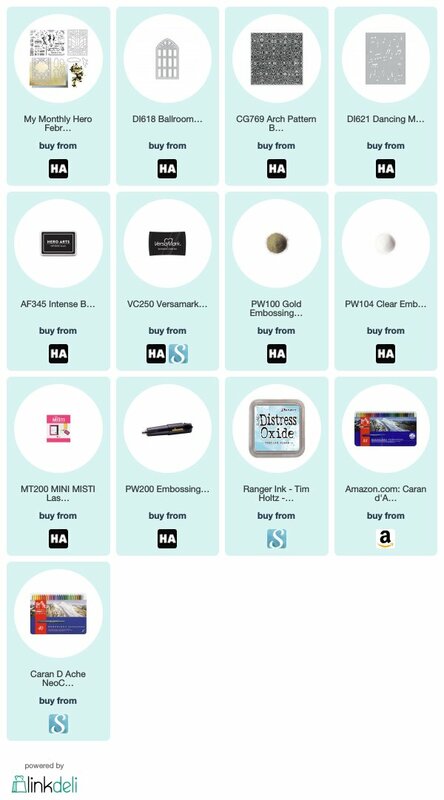 Your kit may ship in a separate box than any extras and add-ons, but no additional shipping costs will apply. I bet this sounds glorious! What an amazing shaker Julee!